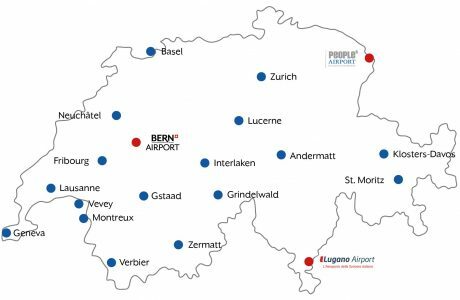 Lugano Airport, Bern Airport and St. Gallen-Altenrhein Airport are smart alternatives for smooth and stress-free flights into Switzerland. Offer your customers all benefits and advantages of leading Swiss regional airports: no slot restrictions, modern facilities with Schengen and non-Schengen immigration facilities, a familiar welcoming atmosphere, dedicated staff members and short distances that allow a start-up in less than five minutes. Ideal location to reach destinations such as Lugano (6 km), Bellinzona (31 km), Como (35 km), Locarno (44 km), Milan (70 km) and Andermatt (112 km). Ideal location to reach destinations such as Bern (10 km), Fribourg (40 km), Interlaken (50 km), Grindelwald (70 km), Gstaad (80 km), Lausanne (105 km), Lucerne (120 km), Zurich (135 km) and Geneva (175 km). Ideal location to reach destinations such as St. Gallen (17 km), Bregenz (23 km), Lindau (38 km), Vaduz (59 km), Lech/Zürs (98 km) and Zurich (104 km).